Boyd & Sons was founded in 1819 at Boston, Massachusetts by James Boyd, an Irish Immigrant. James was the son of Hugh and Mary Patton Boyd, and was born in Newtownand, Ireland on November 11, 1793. He married Margaret Curry of Cainey Caw, Ireland in 1815 and came to Boston in 1817. 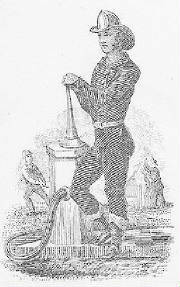 His firm was well known as saddlers and manufacturer of leather fire hose, buckets and helmets and general fireman’s supplies. The Boston firm was also a well established accoutrement maker for the U.S. Government. During the Civil James Boyd’s son Alexander Boyd continued the business. 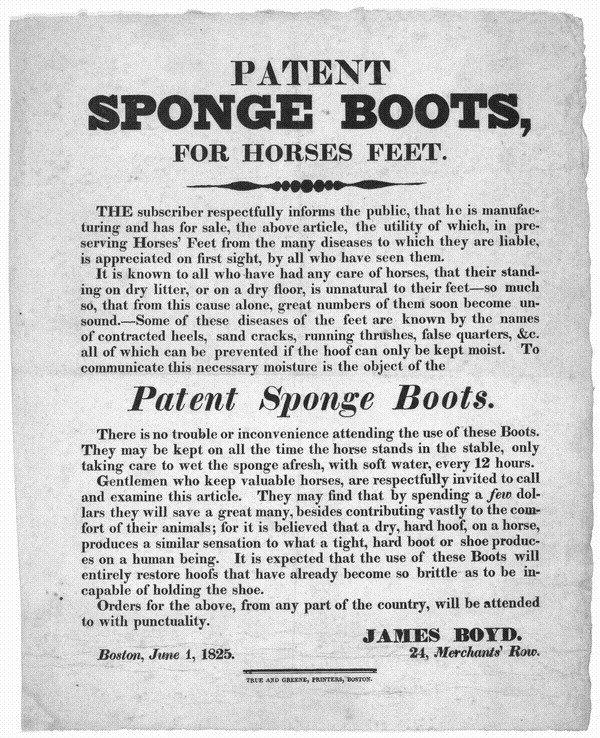 1825 broadside advertising "Sponge Boots" made by the Boyd Company. James Boyd became a member of the Boston volunteer fire department.. He was the founder of the Charitable Association of the Boston Fire Department and drew up its constitution and by-laws in 1828. This Charitable Association was the first of its' kind in the country to be originated for the benefit of the fire fighters injured in the line of duty. He was elected the president of the board of trustees from May 1838 to January 1839 when he retired. He died in Boston in 1855. In 1881 under the leadership of yet another generation of Boyd’s the firm moved to Philadelphia, Pennsylvania. 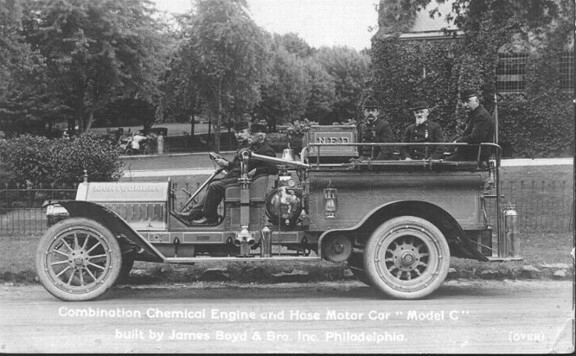 Know now as James Boyd and Brothers, Inc they designed and built fire apparatus from 1908 to 1916. 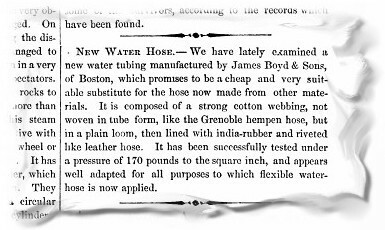 They held some early fire hose patents and made hose carts, hose carriages, ladder trucks, hose wagons, combination chemical hose wagons, and motorized equipment. (reverse of card) Early fire apparatus manufacturers used photo postcards extensively for advertising. 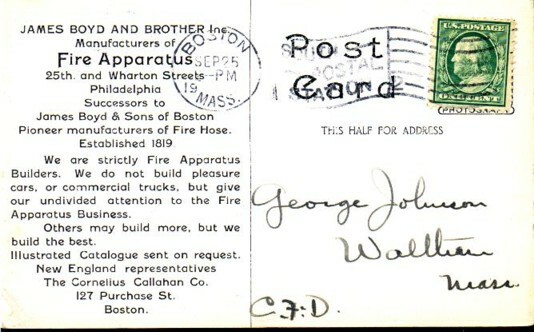 This card was sent by the New England representative, The Cornelius Callahan Company of Boston. The Boyd company went out of business in 1918 due to World War I. James Boyd later would found the National Foam Company sometime after World War I. Today National Foam is part of the well known Kidde brand of fire protection equipment and systems.